Valentine’s Day is celebrated by lovers and spouses all over the world as a time to celebrate and indulge in their feelings for one another; however, for many people, it comes a little too close on the heels of the big Christmas spending splurge. 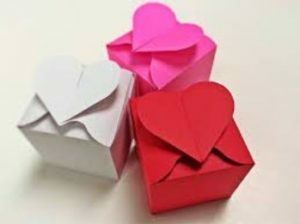 It can be daunting to know that you’ll need to think of a memorable way to impress a Valentine before you’ve really recovered financially from the last couple of months. Nothing helps you and your date to come to a closer understanding than attempting to develop a new skill together. Whether you tackle origami, clay sculpting (remember to protect your carpets! ), matchstick modelling or even decide to take a leaf from Leo’s book and try your hand at life drawing a la Titanic, not only will you learn to support one another’s attempts at creativity – or perhaps engage in a little friendly competition – but you’ll also come away having made something that will remind you of this Valentine’s Day forever. Top tip: Free, easy to follow tutorials for a whole host of creative activities can be found on YouTube. Look around for board or card games that can easily be played by two people in the comfort of a living room. This idea works really well for those who are easy going, but competitive types and perfectionists may need to approach with caution! The best plan is to find games with straightforward rules that you trust not to stress you out too much. 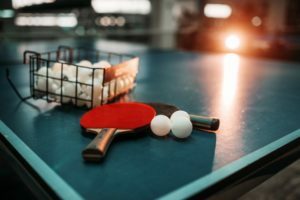 Top tip: If you have the space and the equipment, intersperse more physically relaxed games with something more energetic – like mini table football, ping pong or even darts – for a little variety. If you’re happy to get a little tipsy, beer (or Prosecco) pong is always great fun. Otherwise, think about laying out a scavenger hunt around the house – particularly if a fireside proposal is on the cards! Make some popcorn, crack open a bottle of wine and rearrange your furniture to create an intimate cinema setting. With nothing but the flickering of a hearty fire providing ambient light, the scene can be perfectly set to snuggle up and watch something together. Top tip: Plan the programme beforehand so you don’t waste half an hour arguing over what you want to watch! 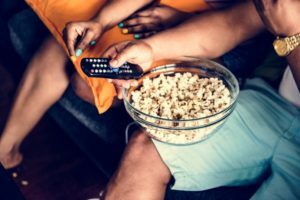 Try to get a good idea of whether your date will truly enjoy your movie choices and that they’re not just being polite. After all, it’s fine to have differing tastes as long as you both respect each other’s. Perhaps give yourselves enough time to watch a movie each – one of your own choice and one of theirs. 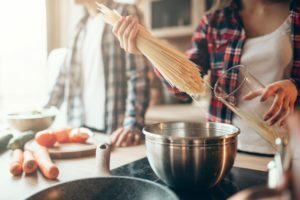 It’s natural for foodies to crave a lavish restaurant date on the most romantic day of the year – but there are ways to fulfil the desire for a delicious meal without breaking the bank. Depending on your own preference, you and your beau could make the preparation of food into its very own experience before sitting down to tuck in, or the owner of the house in which the date is taking place could prepare a few luxurious courses for you both to enjoy by firelight. Remember to ask about any allergies before you settle on a recipe! Top tip: Create a buffet of several small dishes, allowing you and your date to eat as much or as little as they want as just one part of an evening of activities that could involve any of the above suggestions too. Enjoy this article or what to know more?